Cox encourages responsible internet use. Our internet use policy is consistent with the Digital Millennium Copyright Act and allows us to take steps when we receive notifications of claimed infringement. Repeated notifications of claimed violations on your account could lead to Internet service suspension or termination. All notifications that are received by Cox are viewable via My Account at www.cox.com/resaccount/home.cox. All notifications on your account include a link to www.cox.com/copyright to learn more about the DMCA laws. If you have received a notification of claimed copyright infringement on your account, My Account displays the following header when you sign in. This portal allows you to view all of your account notifications, including those for claimed copyright infringement. On your Customer Copyright Notification page, you will find a list of the copyright violation notices on your account. You can view a list of copyright violation notices from the Customer Copyright Notification page as shown in the image below. Important: Details on notifications received on your account prior to October 12, 2017 may not be available in the My Account Customer Portal. 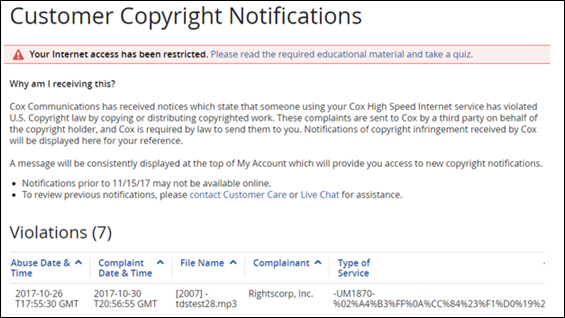 If you continue to receive copyright infringement notifications on your account, Cox suspends your Internet service. In the Customer Portal, you may reactivate your Internet service up to two times. If your account is suspended or terminated for repeated copyright infringement, the following message displays. If your account continues to receive copyright infringement notifications, your Internet service is terminated, and the following message displays on your account. If your Internet service is terminated for this reason, you must call in to speak with a Cox customer service representative prior to your service being reactivated.